Locations RV depots across the US with addresses, maps, and directions. How it WorksEverything you need to know about renting an RV. Travel USA in style by searching and booking your RV / Motorhome in three easy steps. Class C RV’s are the most common type of RV. Class C RV’s are characterized by the large bed directly over the drivers cabin. Class C’s are available in many sizes. I have seen them as small as 22’ and as larger are 35’. These motorhomes tend to sleep more people than a similar sized Class A as you get that extra bed over the driver. Most Class C RV’s allow you to walk from the driver’s area into the cabin of the RV, but I have seen exceptions to this, so it is always good to ask before you rent the RV if this is important to you. 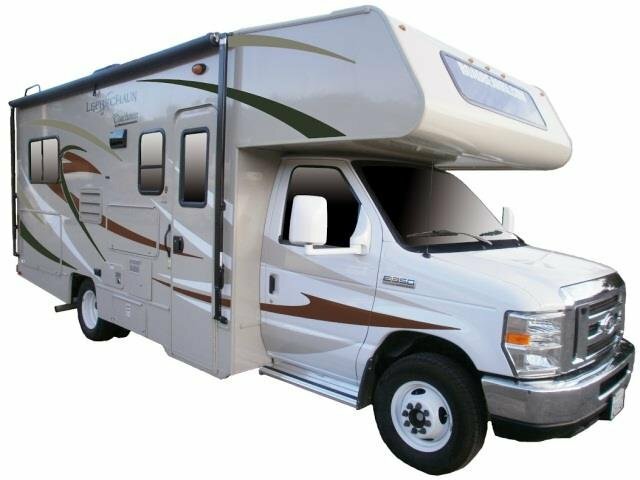 This RV will tend to be a little easier to drive compared to a Class A motorhome because the wheelbase is much more similar to regular passenger vehicles. In the end this is the most popular type of RV simply because of the extra sleeping space that it provides. Class C RV’s can be rented from almost any major city across the US including, Phoenix (PHX), Los Angeles (LAX), Chicago (ORD) San Francisco (SFO), Denver (DEN),Boston (BOS) Miami (MIA), Orlando (MCO), Ft Lauderdale (FLL) Las Vegas (LAS), RENO (RNO), New York City (NYC), Dallas (DFW), Salt Lake City (SLC), and Seattle (SEA). Enjoy this 7 day self-guided tour, as you explore the beautiful beaches and rich history of Florida. After you have flown into MCO Orlando International Airport spend the first night at your hotel. If you are flying in from another country you may be required to spend your first night a hotel. Check out some of the local Latin inspired cuisine or some of Orlando’s hot night life. Depending on which company you have rented your RV from you may be able to pick up your RV in the morning or you may have to wait until early afternoon. If you love baseball, Point Saint Lucie is the spring training site for the New York Mets. Stop by the field and see how the team is shaping up for the coming season. Visit the only US Navy SEAL Museum, where if you got any closer you would have to enlist. Spend the morning exploring the mysteries of Coral Castle. This castle was built with 1000 tons of stone by a single man. Spend the afternoon swimming in the Venetian Pools, built in 1923 in an old rock quarry. Make your way down to the southern most tip of the US, Key West. Dive or snorkel in the United States only living coral barrier reef. Visit the Key West Butterfly and Nature Conservatory or just spend the day on the beautiful beaches of the Florida Keys. The Royal Palm Visitors Center is the best place to start when visiting the Everglades. They are the experts, they know the trails, ponds and canals that you should be visiting in the hopes of seeing some gators. Whether you want to visit the Florida Aquarium, Busch Gardens, Lowry Park Zoo or Adventure Island, Tampa Bay has lots to see and do for the last leg of your trip. Your RV will be due back at the rental location in the morning of the last day of your trip. Drop off your RV early and spend your last day doing some of the things that make Orlando so popular. Visit Universal Orlando, the Magic Kingdom, Epcot Center or Disney’s Hollywood Studio. This 7 day self-guided tour is just an example of the many things you could do while you are visiting Florida. Customize this tour to make it your own and enjoy all that Florida has to offer. Book now for pick up between Nov 1, 2013 and March 31, 2014 and we will waive the one way fee. With 14 locations to choose from you will be sure to find a holiday to suit you. With the cold weather setting in why not get away from the snow and head south for a few weeks. You could pick up in Chicago, New York, Boston and Seattle and drop off in Orlando, Ft Lauderdale or how about Los Angeles. You could even do a cross country trip from San Francisco to Atlanta. Or look at Dallas, Salt Lake City or Las Vegas. With these 14 cities to choose from there are endless possibilities for this years winter vacation. Ft Lauderdale has some of the best beaches in the world. If you are looking for a beach where you can sit back and let the sand run through your toes, or if the adventure of catching a wave is what gets your heart pounding the beaches of Ft Lauderdale are not going to disappoint you. For a family friendly beach Deerfield Beach is a favorite. There are nine life guards on duty 365 days a year from 9 am – 5 pm. Alcohol is not allowed on the beach and either is any glass containers, making this beach safe for little ones in bare feet. Surfing and body boards are permitting put only in certain areas of the beach, and the same goes for any ball or Frisbee games. Dania Beach may be one of the least crowded beaches but it has some of the most magnificent scenery in the area. If visiting this beach you will need to eat at the Dania Beach Bar and Grill. Eat right on the pier with water as far as the eye can see. The high rises behind you remind you have close you really are to the city from your little piece of paradise. Visit Hollywood Beach, this beach boast 7 miles of beautiful sandy beaches, 2.5 miles of paved trail, an array of restaurants from casual burger and pizza joints to international cuisine. The broadwalk is a great place to eat as it allows for some of the best people watching around. The locals rave about Josh’s Organic Garden which opens onto the broadwalk every Sunday which is a great place to stock up on picnic ready items. The coral reefs in the area allow you to get close up with nature as you snorkel through the reefs looking for local residents. The Hollywood Beach theatre has live music 5 nights a week, but watch out for the turtles, if you are lucky you may be able to watch the sea turtles hatch right on the beach. Fort Lauderdale Beach is one of the most beautiful beaches around, the turquoise water and the palm trees that sway in the wind who could ask for more. But there is more, cute boutiques, quaint restaurants, and a water sport for everyone. Where? Various locations, see website. What? Four days celebrating the culinary lifestyle of South Florida. This event will feature local and regional restaurants and chefs, world class wine and gourmet specialty foods. Where? On the beach at the Pompano Beach Pier. What? Music, food and fun. This non-profit event supports many local community groups. Where? Bonnet House Museum and Gardens, 900 North Birch Rd, Ft Lauderdale. What? Come to an evening of classic operatic music by Florida Grand Opera’s Young Artists. Where? 6 locations connected by shuttles, water taxis and riverboats. See official website. What? Exhibits include yacht builders and designers, exotic cars and brokerage yachts. There will be lots of boats, including runabouts, sportfishers, high performance boats, cabin cruisers, skiffs, sailing yachts, ski boats and more. Where? 503SE 6th St, on the south side of the New River, one block East of the Broward County Courthouse. What? Entertaining features, documentaries, and shorts from around the world. Rent an RV and savor the sun in Florida, “The Sunshine State”. Florida RV rentals are a dream vacation because it has some of the best beaches in North America, it has more water parks than anywhere else in the USA, plenty of amusement and theme parks (including Disney World), and is a primo state for golfing 365 days a year. Drive your Florida RV rental to an assortment of attractions like Gatorland, Monkey Jungle, the Kennedy Space Center, or The Florida Everglades. Drive your Florida RV rental over to Gatorland in Orlando, Florida. Gatorland has been around since 1949 and has turned into a popular attraction because it is a 110 acre alligator theme park and wildlife preserve that is closely located near Walt Disney World, Universal Studios, and the Orlando International Airport. Gatorland is definitely affordable family entertainment with its amazing display of huge alligators and crocodiles, train ride, aviary, breeding marsh, bird sanctuary, petting zoo, nature walk, and unique shows. Once you have left Gatorland, don’t forget to park your Florida RV rental at the Kennedy Space Center which is located 45 minutes east of Orlando. The Kennedy Space Center is the world’s only launch site for the Space Shuttle. It’s also the only place on earth where you’ll be able to tour launch areas, meet an Astronaut, view massive rockets, train in spaceflight simulators, and view a launch. If you are driving your RV rental in Miami, your next pitstop should be at Monkey Jungle – “Where the humans are caged and the monkeys run wild”. There are a total of 30 species of primates at Monkey Jungle. Monkey Jungle proudly participates in an international effort to save the species that are threatened with extinction and the park is a truly entertaining and unforgettable place. Now that you’re in southern Florida, why not drive your Florida RV rental to The Florida Everglades? The Florida Everglades, otherwise known as “The River of Grass”, is one of the largest wetlands in the world and the only subtropical preserve in North America. The Everglades are a shallow sheet of fresh water that travels over the lowlands and through billions of blades of sawgrass. You can tour The Everglades by foot, tram, airboat, or canoe. See our RV rentals in Florida. USA RV Rentals has designed this blog in order to keep our clients updated on discount RV rentals, vacation information, events, attractions, RV resorts, and more! Rent an RV / Motorhome and enjoy the freedom to explore major cities and attractions across the United States of America. We specialize in round trip and one way RV rentals... you choose the destination pickup and drop off points as well as the dates. Easy! © 1998 - 2019 All Rights Reserved.